Dr. George Achoki has been appointed as a Commissioner at Energy Regulatory Commission (ERC) by the Hon. Charles Keter Cabinet Secretary for Energy, for a period of 3 years with effect from Friday, February 8, 2019. 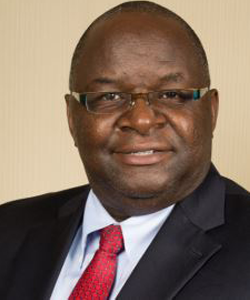 Dr. Achoki is an Associate Professor of Accounting and Finance in the Chandaria School of Business, with experience in management, academia and board directorship spanning over 20 years. He began his teaching career as a Senior Lecturer in Kenyatta University, before joining the faculty of the Africa campus of United States International University in September 1997. He was the coordinator of the Global Executive MBA program for seven years where he spearheaded partnerships with 4 international universities, and chaired the committee that rolled out the first doctoral program at USIU-Africa. He rose to head the Chandaria School of Business as Dean between 2013 and 2017. He has published in the International Journal of Economics and Finance, the American Journal of Finance, and the Journal of Business and Management among others. He has authored 2 book manuals, and over 15 publications and conference presentations, and facilitated over 100 training sessions for corporate, public and not for profit executives. Dr. Achoki holds a Bachelor’s degree in Commerce, a Master of Commerce in Accounting and Statistics and a Doctor of Philosophy in Human Resource Accounting, all from Sukhadia University, India. He has also been a resource person for Commission for University Education (CUE) formerly Commission for Higher Education (CHE) for over 10 years, and Inter University Council for Higher Education (IUCEA). Between 2016 and 2018, he served as a Council Member at the Export Promotion Council where he chaired the Strategy, Product Development and Promotion and the Finance and Resource Mobilization Committees. As a Commissioner, Dr. Achoki will provide oversight to the Commission’s management whose mandate is licensing and regulation, enforcement and compliance, and dispute resolution in the energy sector in Kenya.